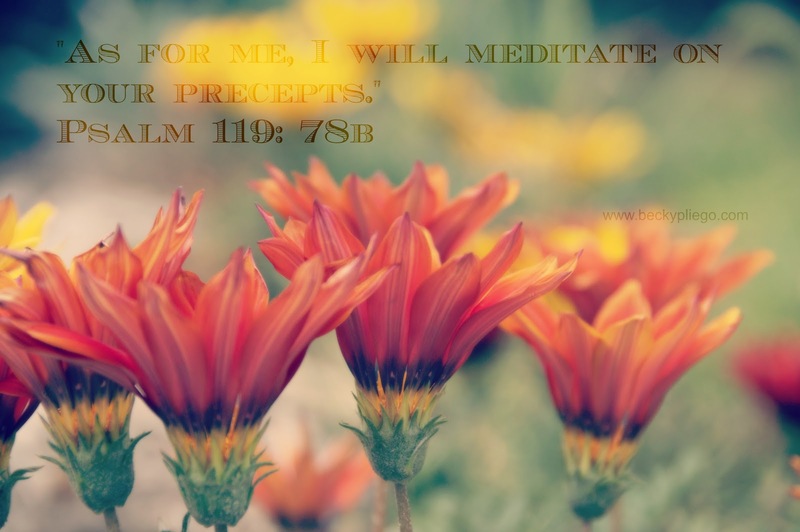 If you need encouragement to purposely meditate on God’s Word, please read Psalm 119 -today-. I have been reading it and the more I read it and the more I consider it, I keep seeing that there really is no other way to meditate on God’s Word all day if we are not purposely doing something about it. It has to happen in real time. And how do we do it? We could carry verses in our purses, inn our car, put them on the fridge, or hang them on our walls, and then we should not forget that they are there, but instead it would be good if we could make halts during the day to read and consider them, and pray them and then, live them while driving through the busy streets, or the moment we cook breakfast, or when we explain Math to our children or talk with them about their future, or when we are at Starbucks having coffee with our friends, or the times when we are with our husband in our room with the door closed. Or we could also start (or continue) memorizing the Scriptures. This is a perfect way to meditate on the Scriptures all day; and yes, it is challenging, but so rewarding! Let us encourage one another to abide in the Word. *Please, feel free to download the image on this post for your personal usage (including your blog). I just ask that you don’t modify it and link to this blog. Thanks. This entry was posted in Exhortations, Memorization, Psalms, Spiritual Disciplines, Studying_the_Word, Taste and See by Becky Pliego. Bookmark the permalink. Thanks for the encouragement, Becky! v120 has been on my heart from this Psalm this week: “My flesh trembles in fear of You. I stand in awe of Your laws”. I can only stand in awe of His Word when it dwells in my heart. May we all meditate much more on Him and His Word. Love you!